Wedding ceremony programs, made to look like fans are what many couples are after when it comes to choosing a ceremony program. 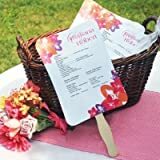 Whether it is printed for them, or they choose to print their own, it's a nice idea to offer guests who will sit through an outdoor marriage ceremony. Beach themed and summer wedding events are the occasions that most call for a fan type program. Holding onto a stick and fanning away the hot air is a nice option for guests sitting in the sun on a hot day. There is no doubt that they will enjoy watching your ceremony a lot more if they are comfortable while doing so! For a DIY wedding project, creating a custom fan program has options. Lets look at them. DIY With a Pre-Printed Program, or Buy a Fan Kit? Buy paper, sticks, and glue. Set up wording and print out paper. Assemble fans. Buy a kit which includes (kits vary), blank paper, sticks, glue and directions. Set up wording, print and assemble. Buy pre-printed (with your text) paper, decorated in your wedding theme. Buy sticks, glue and assemble. Your options are to make your own wedding program fan, or buy a kit and assemble it according to their directions. This is almost the same thing, right? True, but what if the program itself was already printed and decorated, and you didn't need to mess with any of that? Then all that is left is to attach it to a stick, or however you plan to present it. Unless you know what you are doing, lining up text for a good looking program is not particularly easy. How many font styles do you have access to? How much ink will you need? Will the end product look just okay, or fabulous? Buy the Zazzle fan programs assembled or not assembled. A newer item to customize at Zazzle is the fan program. It comes with sticks and glue dots (if you want to save money and assemble them yourself). Or buy them already assembled and save time. The program fans come in a variety of shapes and the heavy card stock can be purchased in white or ecru. Be aware that these programs are not huge. They range in size from 4x6 inches (paddle and rectangular shape) to 5.75 inches (round shape) and 6x6 (heart shape). For this reason, not a lot of text can easily be added in print large enough to see. 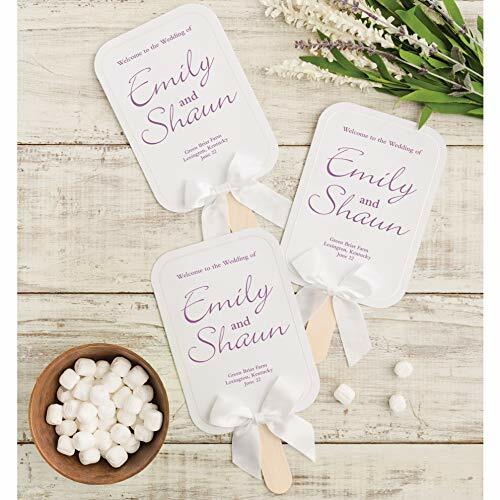 These fans are best used at a short, casual ceremony held outdoors where it could be hot enough to need to fan ones self. 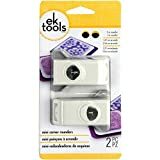 The kit linked here will provide enough sticks and paper to create 50 fans. It also includes glue dots and a CD with templates. You will also get a test printing sheet and instructions. The paper is 80# cardstock. Be aware that the paper will be blank, plain white, - without the floral image. All images and text will have to be designed by you. Tropical color and starfish couple design. This one includes pre-made bows. This kit is similar to the first one I mentioned but it's created by the well-known Wilton company. Most people recognize the name for their cake molds and decorating items. Each of Wilton kits can create 24 fans. Along with the blank paper, adhesive strips and sticks, it includes white, ribbon bows which are ready made. The Wilton brand is well known, but you'll need more than one set if the wedding is large. Each kits makes 24 fans. 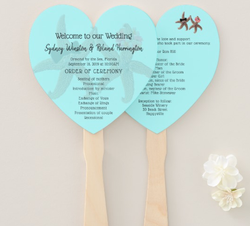 The new wedding fan programs available at Zazzle can be assembled quickly using glue dots provided. Use the 4 glue dots - which come with each program - to attach the front and back printed programs to the wooden handles. These programs come in sets of 10 and there will be a charge of $9.00 for each set to buy them pre-assembled. Save money and do it yourself if you have the time. Fan handles come in bulk (100). A corner punch can round paper corners. Glue dots are removable to re-position paper if need be. A number of years ago when I had just begun doing a lot of wedding products, I was contacted by a bride who wanted a "fan" for her program. It was the first time I had ever heard of such a thing. I work with the Zazzle site and produce items according to what products they have available. At the time, I had to use the letterhead paper (8x11 inch size) and provide a line at the bottom for the customer to cut off the excess and create a square paper to make her own fan. Why did she go to all that trouble? Because she loved my design, and it matched her black wedding them. We worked together to make just what she wanted and you can bet that no one else ever had a wedding program that looked like hers. That is the wonderful thing about Zazzle. Designers can create nearly anything to match the theme you choose. Now that sturdy "fan programs" can be made to match my wedding designs, you can bet I will be creating templates for all my favorite, best-selling designs. Because most customers are shopping at Zazzle to find products with easy-to-use text templates, I add sample text to most of the products I sell. Blank paper is easy to create yourself as all lines of text can simply be deleted from the product. Sometimes I make blank paper to add to my store, and often a customer will make a request. Replace text in a ready to go template is easy, but some people do prefer to print their own invitations or programs or whatever. I suppose the paper can be used for scrap-booking also. Because the new fan programs contain thick card-stock, those can't be printed at home. I do take requests so please ask for a custom made fan program in your preferred theme / color. Are fan style programs for you? Love this idea! Wonderful for weddings in warm weather, outdoor weddings, etc. DIY fans are a great idea if brides have the time, or enlist the bridal party to do it. Fan programs sound great! I love your designs, and I think it would be easy for people to customize one of those and then glue the stick. They look really great and definitely a wonderful idea for summer weddings. The beach wedding template is so beautiful! I think it's easy enough to put together a fan program, but the printing part could be tricky. Yes, I think the prices are reasonable. I haven't done any ceremony stuff by myself but the ideas presented here certainly inspire me to do so. They are very affordable too. Great idea and options to think about! @Alexandria, it sounds like you did a lot of the modern things brides do for their weddings these days. I made some "camera cards" for a bride recently. @ Abby, I learn a lot from working directly with customers! @Ologsinquito and Kathleen, thank you very much! What a great idea, especially for the summer! You've covered all choices and given lots of advice. Very useful and practical info! Impress your wedding guests with ceremony programs that match the tropical surroundings.